What a better way to start the week than with a giveaway! 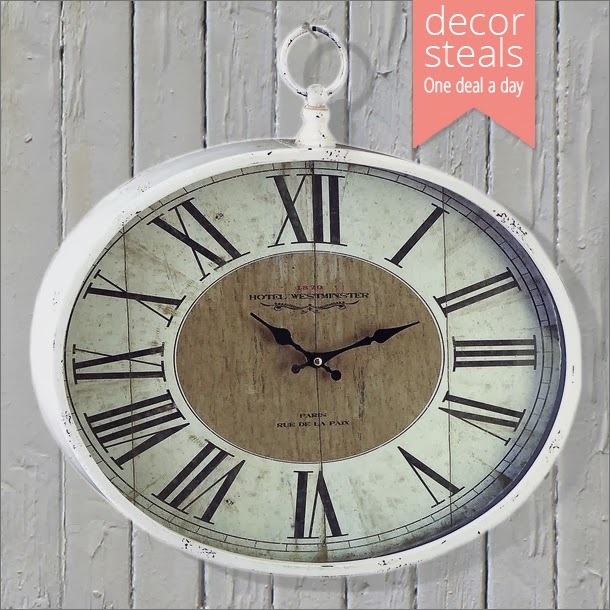 Decor Steals is a fabulous daily deal sight that can pop in your inbox every morning at 10 am eastern time. They also bring back some of the top sellers in "extended steals" section. Say that three times fast. 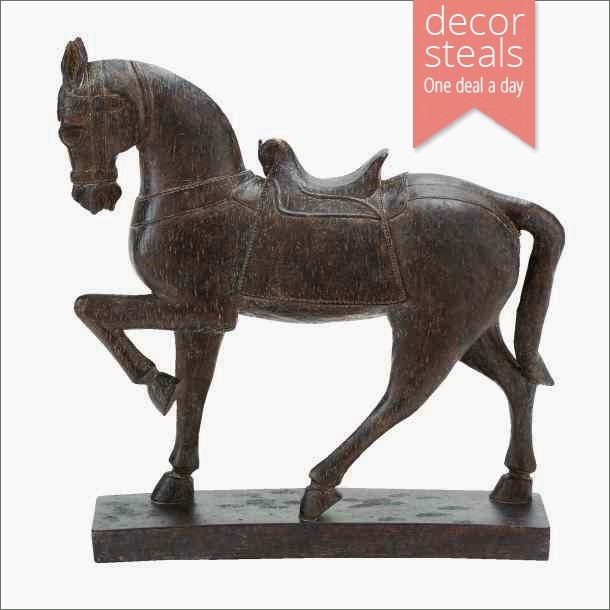 Decor Steals is a small family owned business that strives to bring you the coolest products at a fraction of the cost. Today's steal is this tiered plate stand. This will be available today starting at 10 am eastern time. You can sign up for the newsletter here and you will receive it daily in your inbox to let you know a new steal is up. I've been shopping decor steals probably ever since I found their site when it was called WUSLU then the name was changed to Decor Steals in 2012. I got a great deal on this cow head that adorns the hood over my cooktop. Y'all know how much I love grain sacks and I have gotten several from Decor Steals at a great price. I even have some of this fabulous fabric and haven't done anything with it yet. It's a good weight and has the look of grain sack cloth with the stripes. This will be a future sale, too. One of these vintage olive buckets is great for so many things and will be coming up for sale again. It makes a great container for a fiddle leaf fig or other large plant. I think I am going to be watching for this when it comes available. It is the year of the horse, you know. I love big clocks and have several. Of course I had to have the southern states framed picture. And the best part shipping is always $5! So let's get on with the giveaway! 1. 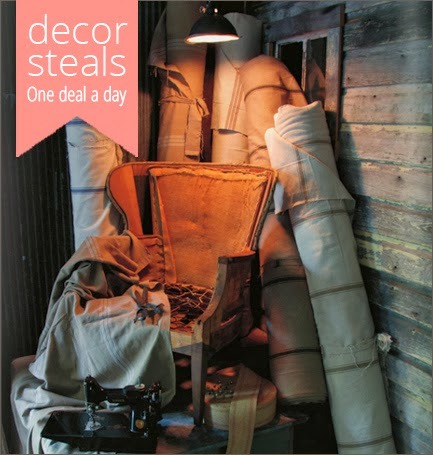 Check today's deal at decorsteals.com and extended steals and tell us which deal strikes you the most. While you are there you can also vote for a future steal by liking any of the deals in the Pick a Steal section. Cool right? 2. Subscribe to their email newsletter HERE so you don't miss any of their daily deals or their Flash steals. Be sure and leave a separate comment for each entry. That's four entries to increase your chances. Remember if you don't have a blog be sure to leave your email address so you can be contacted if you win. This giveaway is open to the contiguous US only and will end Wednesday 2-26. I'm waiting on the olive buckets to come up again. I love the (sold out!) Burlap bucket bags! I get their e-mails. Thanks for the giveway. I love all their steals. It's hard to pick a favorite. The bird cage terrarium looks awesome! Followed on Google Plus and saw Anita's beautiful bed in the Blue Bonnets field in the header!.. Loved the Mason jar wire shelf, subscribed to newletter, liked on Facebook , and following on Google! Can't wait to win! I have been receiving their email newsletters for over a year. I checked out their website and it looks great! I just think those vintage olive buckets are awesome, think I need some too! I love Decor Steals too. I got my olive bucket from them. Its fun to get their emails every day to see what is the daily steal. Love Decor Steals and have been shopping with them and receiving their newsletter since they were WUSLU also! Great stuff! Love their dish catty/display in their "pick a steal"! would be great for displaying seasonal dish ware as well! Can't wait for that one! I love getting mail from them every day and have purchased some fabulous items as well. The linen fabric that I got from them is gorgeous! I'm waiting for the olive bucket to come up again! Have a wonderful day! Like them on Google +....love Anita of Cedar Hills bed on their cover!! I can't wait for the olive bucket to be on sale again! LOVE it! Thanks for the great giveaway. I get Decor Steal's newsletters. I also follow Decor Steals on FB... thanks again! I love Decor Steals (as you know). Would love to win this giveaway. I already subscribe to their email newsletter. I also already follow them on Facebook. Following Décor Steals on Google+. Love this site. Did a lot of Christmas Shopping this past year. Liked DS on Facebook. Like the daily email notices! Have been following DS for about six months! I actually like the heifer head. It would look great in my kitchen. I liked the dish caddy on the DS site for picks. I particularly like the wire baskets as there is always something that can be done decoratively with them. I already am a subscriber to Decor Steals newsletter. I already get their e-mails daily and love the latest little interestingly shaped bird cage, candle holder and the lovely setting in which it was photographed. Count me in and thanks! Just followed on Google plus. Just signed up for their daily emails. I used to get them.I don't know what happened. Great deals, following on FB! I love the wire baskets. I love this sight and have ordered a few things from them in the past...love the wired birdcage! I also love that farmhouse style wire table!! Oh I just love the olive buckets! I love the farmhouse metal storage table. I already like them on FB!! I love the three-tier cake stand! I already receive emails from them, too! I am hoping that the striped fabric that looks like a grain sack comes up soon. I need to reupholster a loveseat soon. I also love the dish caddy in the deal picks! I already receive their daily emails. I grew up on a cattle and horse ranch --- the cowhead would be just perfect in my house! i've got a great little corner cabinet that i bought when it was wuslu. love the 2 piece baskets. i like them on fb. thanks! Love the bird cage terrarium! I subscribed to them on google plus! I like their jute rug extended steal the best. I always love their boxwood pieces or the mercury glass candles they offer! I have been receiving their e-mails for several months. I love Decor Steals, and would love to try a few of the indoor/outdoor jute rugs in their extended steals. I already subscribe to their daily emails. I'm following them on Google +. Love their heifer head....ordering today! Following on Google+ !!! Thanks for the great giveaway Kim! Kim, I love the cow!! I've been subscribed to decor steals for 2 years. Love their site!!! Liked their FB page, voted on a future deal, followed them on google. Thanks for the chance to win!!! Love your blog!! Congrats on your 39th anniversary!!! I am following on Google Plus. I LOVE the jute inspired rug!!! I follow Décor Steals on FB. I receive their daily email. I receive Decor Steals newsletter. I like Decor Steals on FB. I 'liked" Decor Steals on Facebook! I signed up for the Decor Steals newsletter! I haved been an email member since it was WLSU also. I love this place and have so many cute things from them. Love, love, love the teir cake stand! Pick me please! 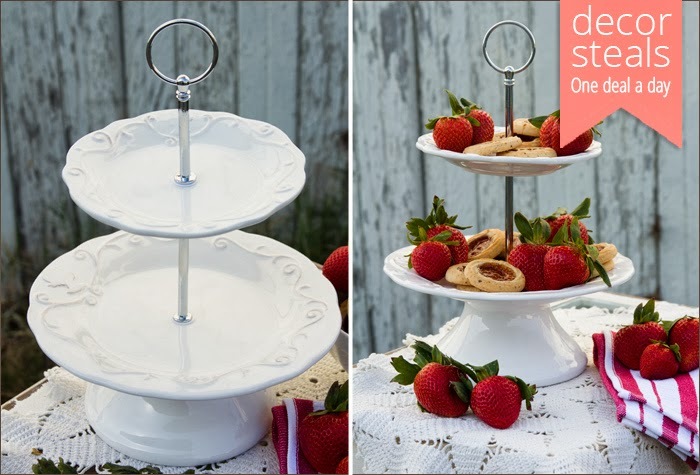 Love all of their products…cake Stand is great! Kim, Thanks for the opportunity to win this gift certificate. I love the farmhouse metal storage table and have a spot for it! Great giveaway, Kim. I shop this site and have been thrilled with my finds. Today's server is a great piece. Also like the dish caddy for a future sale. I subscribe to the daily email. Wouldn't want to miss a shopping opportunity! Yep, I liked Decor Steals on FB. I love Décor Steals and I bought that same cow head when they had a few months back for our new kitchen. I follow them on FB as well as receiving their newsletter. I saw this piece this morning and though, you know, I better wait for that again since I have made many other purchases from them for the house. Now if I w in, that is a different story, right!!! Thanks for t he chance Kim. I didn't know about this site! Thanks Kim! Love the metal storage cabinet! I love Decor Steals and I want the framed Southern States photo. Got one for my sister, but not me. I subscribe to decor steals and love when the new deals come into my email. They have some of the best treasures. Thanks for a chance at the gift card. I LOVE Decor Steals and eagerly look forward to what new treasure will be offered! Several of my favorite home decor came from them! I love the upcoming vintage hardware bin... I am also waiting for the return of the Olive Bucket. Thanks for a wonderful giveaway and must say I really enjoy your blog! I'm an email subscriber; I love receiving their daily email and their flash sales! I visited decor steals. I love the Estate Stone Yearling Heifer Head! They said it is sold out. I wonder if they will get more! Love their site. Thanks for such a generous giveaway. A subscriber to their email. Thanks again for the chance. I liked them on facebook. Thanks. Following on google+! Thanks for the chance. I signed up to receive the email newsletter. I love Decor Steals. I went over abd chose the china caddy. I had already liked the on Facebook awhile back. I follow them on Google Plus. Can't wait for that horse to become available! I look forward to the DecorSteals email every day. 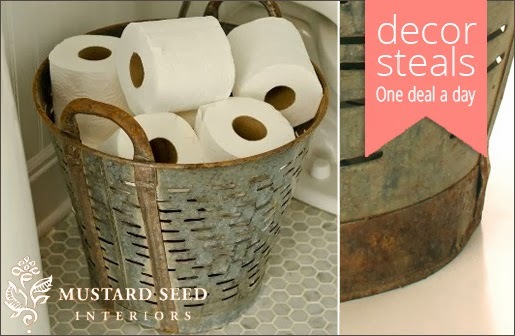 I am following DécorSteals on Google Plus! Love the jute rug! I've being looking for one to go under my cowhide rug. I receive their emails! Thanks! Liked their Facebook page. Thanks for offering this giveaway! I like the ball of string and scissors. I enjoy seeing the special everyday. Love their deals and have ordered before. I like the white ironstone cake stand. I LOVE the Farmhouse metal storage table! Not to big, not to little, lots of storage. Awesome vintage look! I subscribed to Decor Steals newsletter. Such a great site. Thanks for turning me onto them! Liked Decor Steals on FB too! Can't wait to see what they have next! Did all that! I would love some retail therapy. Haven't had any in ages! I am following them on Google+. Now following them via email, thanks to you! I thought the chicken fountain was cute but I have another unique fountain for our place. My favorite thing from them so far was a wall hook that has four hooks and turns. I love it! My aprons made from vintage fabrics hang from the one I bought. I have been subscribed to Decor Steals for the newsletter for quite some time. I think the rooster fountain would be a fun addition around here! Hi Kim! I love the sea grass rug. And I'm now a fb follower as well. Thanks! I am subscribed to decor steals email!! I checked out today's deal! Too bad I don't have a spot for a rooster in my house! Rooster gets my vote. Love that! I subscribe to their e-mail! Love the DS wire baskets. I'm waiting for the Farmhouse Metal Storage Table. Signed up for DS newsletter. I could use the southern state map. Love it. I love the FARMHOUSE WIRE BASKETS Kim. Thanks for a chance to win the $50 gift card. I could use a shopping spree! !